Lubrication Mechanism - CSB Sliding Bearings India Pvt. Ltd. When lubrication film exists between two relatively moving surfaces,friction conditions of two contact surfaces can be classified in three steps as below. Lubrication film between the two contact surfaces is thick enough and two contact surfaces are separated completely by viscous oil film.At this time,frictional force of two contact surfaces are determined by viscous resistance of lubricant and it can be take a very small value(coefficients of friction can be 0.0001~0.01).Under this condition, When shaft also rotates due to the viscosity of the lubricant oil and generates oil pressure at the load area.This phenomenon is called wedge effect. The oil pressure P generated within lubricating oil film is affected by change of temperature and viscosity of lubricating oil,surface roughness, clearance and rotational speed of the shaft. Lubricating oil film between the two contact surfaces is extremely thin and no viscous hydrodynamic oil film exists between the two contact areas,only film of absorbed oil molecules exists.Absorptive oil film is arranged oil molecules that are adhered onto the solid surfaces and its shear resistance is greater than hydrodynamic oil film. Frictional force in this area is greater compare to hydrodynamic lubrication. 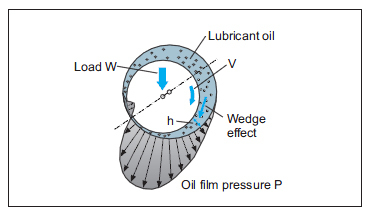 In the frictional contact points,oil film is frequently broken.The lubrication condition that generates a frictional condition such as this is called "boundary lubrication",in order to decrease the friction under this condition selection of self-lubricating bearing may be desirable. Under this work condition,the two solid surfaces contact directly with each other,there is no lubricating film such as hydrodynamic film or absorptive oil film.The frictional force is proportional only to the vertical load applied to the contact surface of the sliding velocity and the static friction is greater than kinetic friction.Thus the self-lubricating bearing material selection is critical to performance.